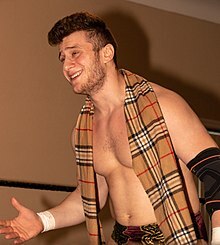 Max Friedman (born March 15, 1996), is an American professional wrestler, better known by the ring name Maxwell Jacob Friedman or the shortened form MJF. He is currently signed to All Elite Wrestling (AEW) and Major League Wrestling (MLW), where he is a former one-time and inaugural MLW World Middleweight Champion. Friedman has also worked on the American independent circuit appearing most notably for Combat Zone Wrestling, where he is a former one-time CZW World Heavyweight Champion and a two-time CZW Wired Champion. Friedman was trained by Brian Myers and Pat Buck and made his in-ring debut in their Create A Pro Wrestling Academy in Hicksville, New York during February 2015. He also wrestled for Combat Zone Wrestling and Five Borough Wrestling during his debut year and went on to appear in numerous promotions across the northeastern independent wrestling circuit. Friedman debuted under the ring name Maxwell Jacob Feinstein. His first match was at CAP Create A Pro Wrestling Show, where he teamed with Joe Bronson in defeating Luciano & Vinny Spano in a tag match. His first singles match was at CAP Create A Pro Wrestling Show IV where he lost to his former trainer Brian Myers. On October 30 at CAP The Places That You've Come To Fear The Most, he joined the CAP Championship Tournament where he advanced in the first round after eliminating VSK. At CAP The Best Deception, he was eliminated in the quarterfinal by Tony Nese. During the September 11 edition of CAP, Friedman & Joe Bronson entered the CAP Tag Team Championship Tournament where they advanced in the first round after eliminating Duhop and Grim. They later wrestled in a four-way tag team match to end the tournament and crown new CAP Tag Team Champions. During the tournament final they faced opposing teams Massage NV, The Breakfast Club (CPA & Francis Kipland Stevens) and The Faculty (Johnny Clash & Mark Sterling). The match concluded with Massage NV emerging the victors and new Tag Team Champions. Friedman & Bronson met Massage NV at CAP A Pro Wrestling Show In New York State, in a four-way rematch involving The Breakfast Club and Da Hit Squad (Dan Maff & Monsta Mack). None of the challenger teams succeeded in winning the tag team titles from Massage NV. His final CAP match was on September 8 at CAP Feeding Times, in a four-way match against Ryan Galeone Bryce Donovan and Delroy Alexander. Friedman debuted under the new ring name Pete Lightning at the August 19, 2015 edition of CZW Dojo Wars, teaming with Hous Blazer in a tag match won by Eddy Blackwater & Josh Adams. During the August 26th edition of CZW Dojo Wars, Lightning and Blazer debuted their new tag team name Business Casual in a match won by team Gunz A Blazin. They won their first victory on December 12 at CZW Dojo Wars Mega Event, teaming with Penelope Ford to defeat team Gunz A Blazin. They went on to compete in many more tag matches during the course of 2016. On the September 7 edition of CZW Dojo Wars and returning to his previous ring name Maxwell Jacob Feinstein, he entered the Dramatic Destination Series tournament losing to Qefka The Quiet. On October 5 Friedman scored his first victory in the Dramatic Destination Series, defeating Lloyd Jameson. During the October 26 edition of CZW Dojo Wars, Friedman challenged for the CZW Medal Of Valor Championship held by Frankie Pickard, in a Best Two Out Of Three Falls match but only scored one win against the champion, therefore not succeeding in winning the title. On May 13, 2017 at CZW Sacrifices, Friedman defeated Johnny Yuma to win the CZW Wired Championship. He won his first title defense at CZW EVILution, defeating Trevor Lee. He successfully retained the title in further singles matches against Mike Del, John Silver and Ace Romero. On October 14 at CZW The Wolf Of Wrestling, Friedman lost the CZW Wired title to Joey Janela. Two months later at CZW Cage Of Death 19, Friedman won the title back after defeating Janela in a rematch. Friedman returned on February 10, 2018 at CZW Nineteen, where he won the 27-Man Battle Royal to become the new number one contender for the CZW World Heavyweight Championship. He also successfully defended the CZW Wired Championship against Alex Colon on that date. He was the last Wired Champion before vacating the title on April 14 at CZW Best Of The Best 17. There he defeated Rickey Shane Page to win the CZW World Heavyweight Championship for the first time. Debuting on October 5, 2017 at Major League Wrestling's MLW One Shot, Friedman defeated Jimmy Yuta. Two months later at MLW Never Say Never, Friedman defeated Joey Ryan. He returned on January 11, 2018 at MLW Zero Hour in a match lost to Brody King. On February 8 at MLW Road To The World Championship, Friedman entered the MLW World Heavyweight Championship Tournament where he was eliminated in the first round by British wrestler Jimmy Havoc. Afterwards Friedman went on to enjoy a winning streak, beginning at MLW Spring Break where he defeated Lance Anoai. He then defeated Fred Yehi and Montel Vontavious Porter at Joe's next two events. He went on to face Joey Ryan on the July 29 episode of MLW Fusion to win the vacant MLW Middleweight Championship. He then faced Ryan again on the September 21, 2018 edition of Fusion, in a mixed tag match where he teamed with Aria Blake to defeat Joey Ryan and Taya Valkyrie. On November 25, 2018, Friedman revealed that he had suffered a fractured elbow with a recovery time of 4-6 weeks. MLW later announced that the Middleweight title has been stripped from Friedman due not being cleared in time for his scheduled title defense at MLW's live Fusion December 14 episode. At MLW SuperFight on February 2, 2019, MJF challenged the new champion Teddy Hart to a match for the Middleweight Championship on a later episode of MLW Fusion. On January 7, 2019, it was announced that Friedman was signed to All Elite Wrestling (AEW). ^ a b "Maxwell Jacob Friedman Cagematch bio". Cagematch. Retrieved July 30, 2018. ^ "MLW BATTLE RIOT RESULTS: TOM LAWLOR STANDS TALL IN 40-MAN MATCH". Wrestling Observer Newsletter. July 29, 2018. Retrieved July 29, 2018. ^ "AEW announced new roster members and some Double or Nothing matches". UPROXX. 2019-02-08. Retrieved 2019-02-22. ^ "Pro Wrestling Illustrated (PWI) 500 for 2018". The Internet Wrestling Database. Retrieved 2018-08-30.